Our big family lunches were never complete without a spread of food. Loobieh, fattoush, shawarma, grape leaves, hummus, labneh, baba ganoush…you name it and it was there! Our family always appeared wealthy and we truly were, we were wealthy in family and food. My parents never spared an expense when it came to food. And anything they touched turned to gold, true miracle workers in the kitchen. Another common dish you’d find at our table was Fasolia. Simple ingredients transformed into something luxurious. 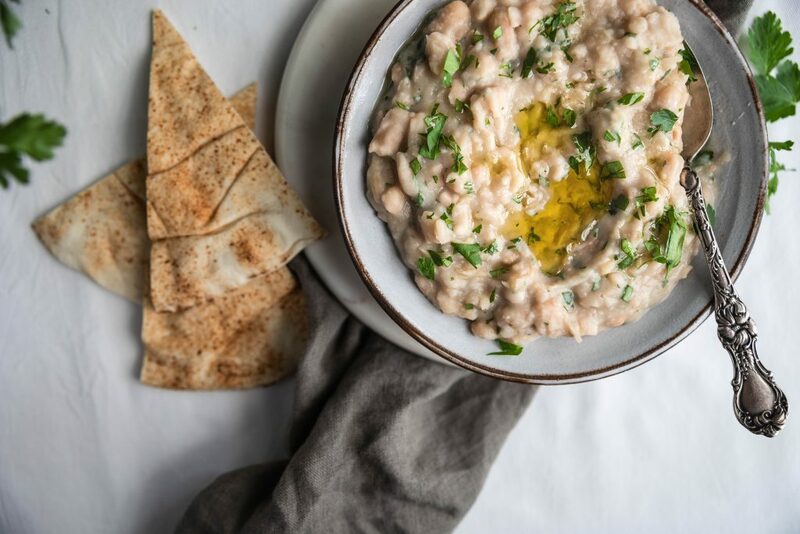 Fasolia is a traditional Lebanese dish made with beans. Most often kidney beans are used, however I like to substitute Cannellini beans for a brighter dish. I think of them as the white kidney bean, they have the same silky texture and nutty flavor but lighter in color. 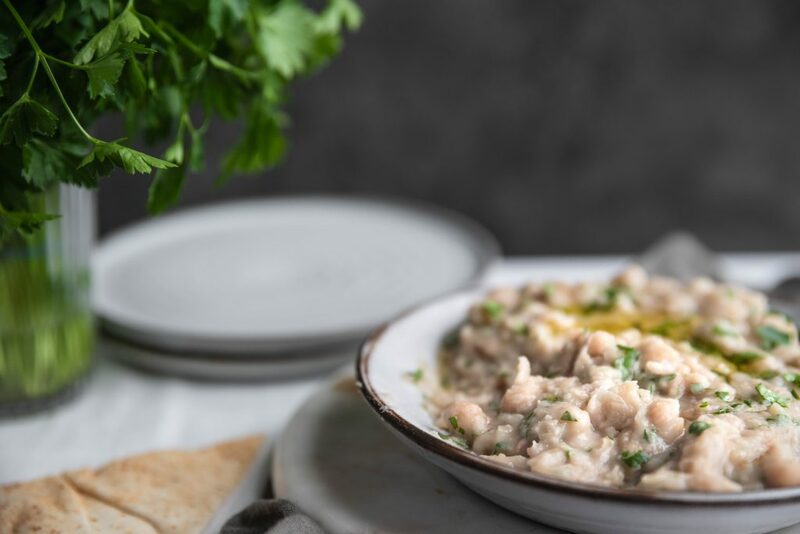 When preparing Fasolia bi Zeit (Bi Zeit translates to “in oil”) I like the light and brightness of the Cannellini beans topped with green parsley to make it stand out. Enjoy with pita bread for the perfect balanced bite. There are several different ways to prepare Fasolia. The first is a very traditional method using beef or lamb that has been stewed and beans are added to create a hearty winter meal. 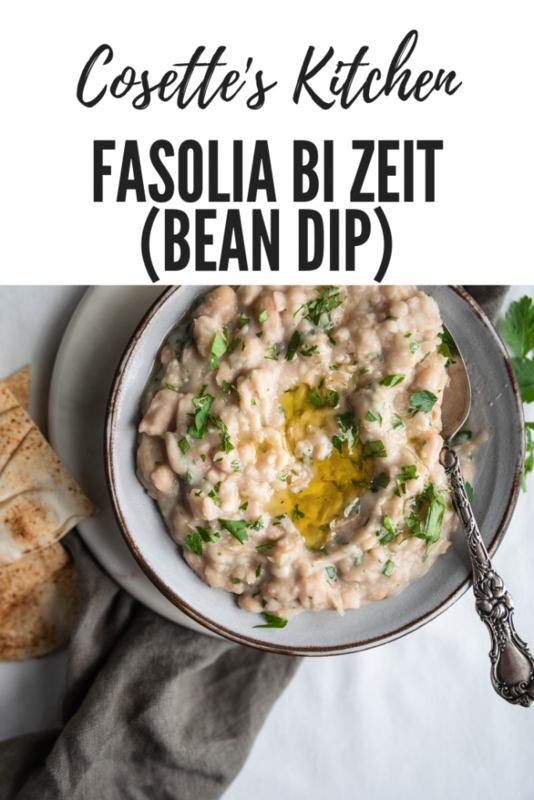 The second is Fasolia bi Zeit, more of a bean dip that is naturally gluten free and vegan, it can be enjoyed as part of a mezze spread and is often served for breakfast. Simple ingredients that most people have on hand create this simple but absolutely tasty dish. 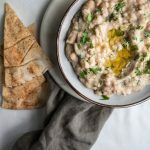 Creamy bean dip with olive oil, garlic and lemon. I think the best part of Fasolia bi Zeit is the fact that it can easily be made ahead of time or on short notice. It’s the bean dip you never knew you needed so badly in your life. A few cans of beans, garlic, lemon, parsley, olive oil, salt and you have yourself the perfect dish. Fasolia bi Zeit is truly not much different than most Lebanese dips with similar flavor profiles. 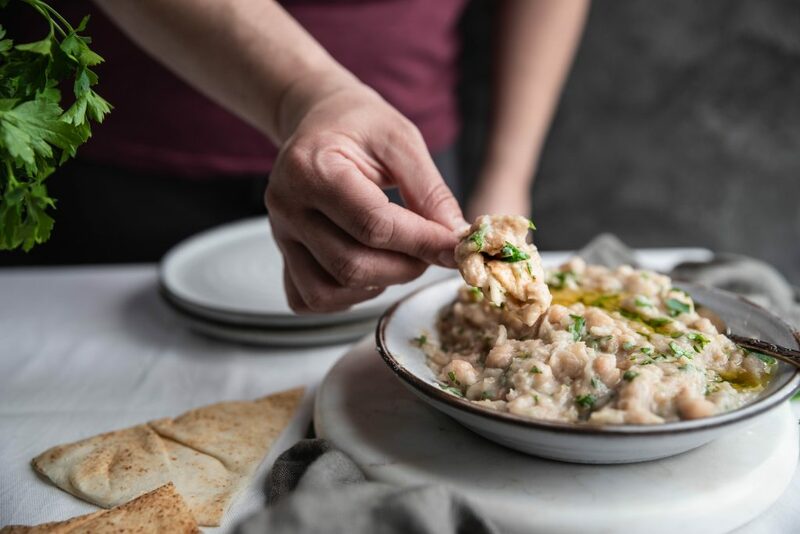 Hummus and Baba Ganoush both include all same classic ingredients. Set out all three dips, some pita, a cocktail and you’ll be set for your guests. That’s the idea with a mezze platter, it incorporates small bites to enjoy while sipping cocktails. Nothing too heavy but filling enough to absorb the alcohol. Delicious as a side dish, appetizer or light summer meal. Check out this simple recipe and add it to your next party platter! As always, I love seeing your creations, tag me on Instagram or Facebook!! Don’t forget to Pin the recipe! 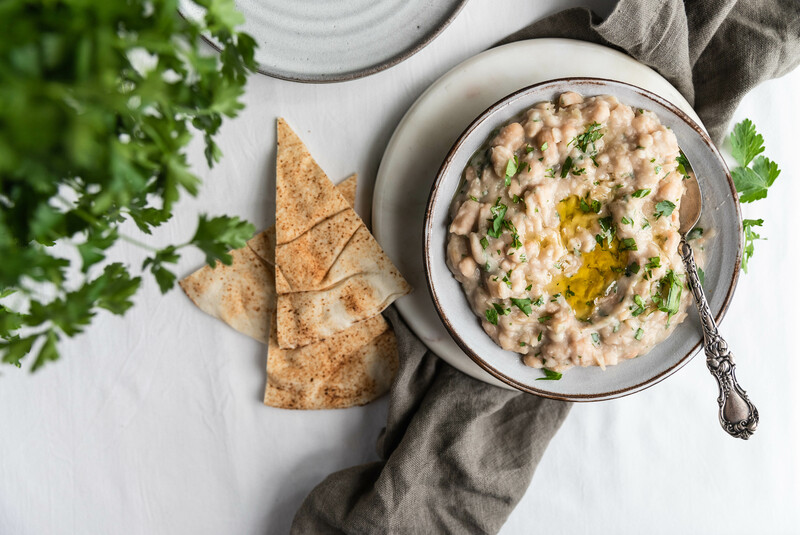 A creamy bean dip perfect for a party platter. Drain and rinse your beans in a colander. Add beans and 1/4 cup of water to a medium sized pot. Let the beans simmer on low heat until warm and slightly broken and mushed, stir occasionally. About 5-10 minutes. In a medium sized bowl, add your 2 cloves of garlic and salt and smash using a mortar. You can substitute 1 tablespoon of prepared toum in place of the garlic if you’d like. Add in the warm beans, mix and finally add your lemon juice and olive oil. Adjust the flavor of lemon, salt and garlic to your liking. Mix in your parsley, reserve a bit for the garnish. Top with olive oil and chopped parsley. Enjoy with pita bread. If preparing ahead, wait to add your parsley and omit olive oil on top. Store in air tight container in fridge. Reheat briefly before serving then garnish as mentioned above.